Indonesia's tsunami detection system, made up of seafloor sensors that communicate with transmitting buoys on the surface, has been rendered useless by vandals and lack of funding. Now Indonesian and U.S. scientists say they've developed a way to dispense with the expensive buoys and possibly add crucial extra minutes of warning for vulnerable coastal cities. The prototype, nearly four years in the making, is designed to detect so-called near-field tsunamis and has been tested off Padang on the western coast of Sumatra. It awaits a decision on government funding to connect it to disaster agencies on land. A tsunami triggered by a Dec. 26, 2004 earthquake in the Indian Ocean that killed or left missing nearly 230,000 people, a large share in Indonesia, raised the urgency of ensuring communities have the fastest possible warnings. 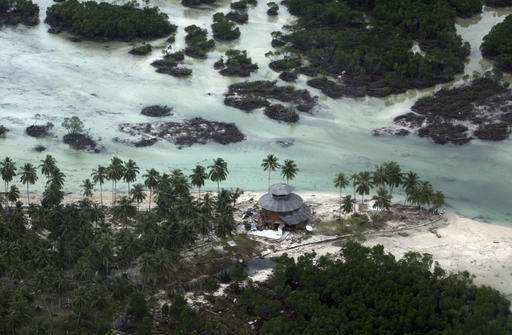 But when a sizeable earthquake struck near the Mentawai islands 170 kilometers (106 miles) from Padang in March last year, none of the buoys in the area meant to transmit tsunami warnings were working. A disaster official said all of Indonesia's 22 buoys, which cost several hundred thousand dollars each and are expensive to operate, were inoperable because of vandalism by boat crews or a lack of funds for maintenance. That quake didn't cause a tsunami but there was a chaotic evacuation in Padang, population 1 million, and other cities, which have at most 30 minutes before tsunami waves hit. Because of lack of information, officials didn't cancel the tsunami warning for two hours. "Now we have no buoys in Indonesia. They are all damaged," said Iyan Turyana, an ocean engineer at BPPT, Indonesia's Agency for the Assessment and Application of Technology. "Where do you live in Indonesia? Jakarta! It's ok. But if you live in Padang, if you live in Bengkulu, your life is very dangerous." Germany and the U.S. provided 12 of the buoys, but did not maintain them, he said. For Indonesians, Aceh province in the north of Sumatra where more than 100,000 people died after 2004 earthquake, is synonymous with tsunami risk. Now, however, Padang and nearby cities face the greatest danger of being wiped out by giant waves. The magnitude 9.1 quake in 2004, centered in the north of a subduction zone where one major section of the earth's crust is being forced under another, released enough energy to make a similarly powerful quake in that area unlikely in the foreseeable future. In the section of that "megathrust" off Padang, pressure has built relentlessly and an undersea earthquake greater than magnitude 8.5 is possible in the next few decades. To boost its detection ability, tsunami-prone Japan has linked dozens of seafloor sensors off its eastern coast with thousands of kilometers of fiber-optic cable. That cost several hundred million dollars and a similar endeavor would be impossibly expensive for Indonesia, a vast but poor archipelago in one of most seismically active regions in the world. But with $3 million of funding from the U.S. National Science Foundation, a prototype network of undersea sensors has been deployed between Padang and the Mentawai islands. 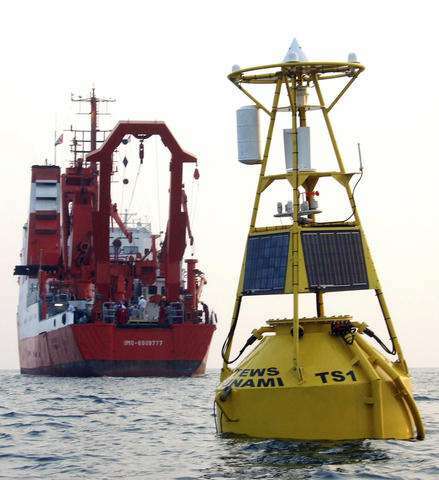 Buoys are not needed because the undersea seismometers and pressure sensors send data-laden sound waves to the warm surface waters. From there they refract back into the depths, traveling 20-30 kilometers to the next node in the network and so on. At its final undersea point, the network needs a few kilometers of fiber optic cable to connect it to a shore station in the Mentawai islands where the cascades of data would be transmitted by satellite to the meteorology and geophysics agency, which issues tsunami warnings, and to disaster officials in Padang. "This entire process likely takes 1-3 minutes instead of the 5-45 minutes typical of the buoy system," said Louise Comfort, a University of Pittsburgh expert in disaster management who has led the project, which also involves engineers from the Woods Hole Oceanographic Institute. "We get a more immediate record of the seismic movement and with that more immediate record we gain a few minutes of very valuable time," she said. "And we get a clearer signal of whether or not there is going to be a tsunami." Laying the cable will cost the Indonesian government about 1.5 billion rupiah ($112,000), said Turyana, the ocean engineer. The Ministry of Research, Technology and Higher Education is considering a funding proposal. The system has not been deployed elsewhere, but could be an option for other poor countries or regions that are vulnerable to tsunamis. 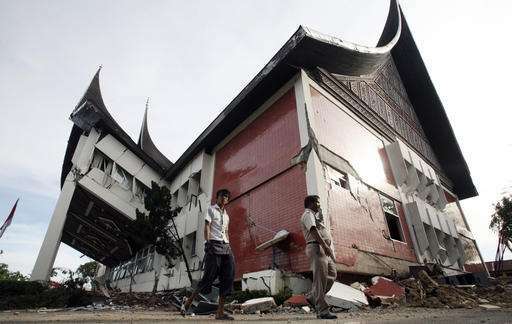 Since 2004, the mantra among disaster officials in Indonesia has been that the earthquake is the tsunami warning and signal for immediate evacuation. Not everyone is convinced a tsunami detection system is essential. "Why? Because the tsunami is too quick to arrive to the land. After the earthquake, we evacuate. No need to detect the tsunami. Just evacuate. That is the second opinion. That is why it is hard to have the budget," said Turyana. Memories of the 2004 tsunami are fresh enough that Indonesians living near the coast typically run for high ground whenever the land shakes, as it frequently does. Yet without a reliable system that reduces false alarms, a "crying wolf" effect will eventually change people's behavior, say proponents of the detection network. Not least, it can give disaster officials give crucial information about a tsunami, such as the heights of its waves and where and when they will hit. "This system is to make sure the tsunami is really coming," said Febrin Ismail, a structural engineer involved in earthquake mitigation and tsunami planning for Padang. "Sometimes after the earthquake, people are running and then they see the tsunami doesn't come. In the future maybe they don't run again. We are afraid the quake itself is not effective."